There’s a reason why white picket fences are so iconic. 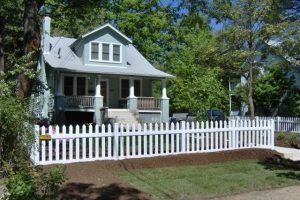 Why do you need a white picket fence? There’s a reason why white picket fences are so iconic. For decades, it was the classic image of achieving the American Dream, or at least a piece of it. If your current fence isn’t giving you enough privacy, then consider adding some more panels. Here are some intriguing reasons why you should think about adding a white picket fence to your yard this fall. A white picket fence can help improve your home’s curb appeal. That’s an important benefit, especially if you are trying to sell your home this fall. White picket fences were first innovated in colonial times, long before vinyl was a common fence material, or even though of. Back then, they were made of wood and painted. But now, you can get vinyl that is already white. It’s much easier to take care of vinyl fences when compared their wooden counterparts. Plus, like other vinyl fences, these fences can improve the security around your home. The leaves may be falling, and your garden may not be blooming anymore. That doesn’t mean your view will be spoiled. Some plants enjoy cold weather, and you’ll find a vast array of colors that you can enjoy. Even though it’s important to keep unwanted visitors off your property, that doesn’t mean you need to sacrifice your view of the landscape you’ve worked so hard on. A great-looking front yard can also make your home more attractive, so you will want to do whatever you to emphasize that fact. Vinyl white picket fences are also incredibly easy to work with; this makes them ideal weekend projects. As long as you already have the right tools on hand, or you can get them without too much trouble, you’ll be happy to know that you won’t need to put too much effort to get the results that you want. Even if you’re unsure of how to begin, we can help. Ask the experts at Hercules Fence to help you get your new white picket fence put up before the rush of holiday parties in Virginia Beach! This entry was posted on Friday, November 9th, 2018 at 3:01 pm. Both comments and pings are currently closed.